A listing of employment opportunities that may appeal to blind and visually impaired individuals. At LightHouse, we’re excited to provide educational workshops on everything from cane use, to cooking to putting your best face forward with makeup. Applying makeup is a learned skill that requires practice and attention to detail, and can involve artistry or light, casual application. The LightHouse Rehabilitation Department, in partnership with Employment Immersion, hosted a new class called “Putting Your Best Face Forward: Using Makeup to Enhance Your Professional Appearance.” LightHouse Independent Living Skills Specialists Bobbi Pompey and Dawn Leeflang, along with Kate Williams, Manager of Employment Immersion teamed up with beauty industry professionals from Benefit Cosmetics. Kate Williams, who is blind, says she believes makeup can be a tool for self-care and empowerment. “Frequently, blind women have said, ‘I’m afraid to wear makeup…I just don’t know how to do it,’” Kate remarks. When Kate’s vision started changing, a manager at Benefit gave her brushes and taught her how to apply makeup non-visually. This experience helped her maintain the self-presentation that had always been part of her appearance and routine. “I’ve always worn makeup,” she says. Kate adds that she was excited to use this workshop to pass on makeup skills to blind people who may not have sought it out otherwise. Bobbi says that this workshop did indeed give one student who was initially trepidatious about wearing makeup the push to incorporate it into her routine. Kate says that she feels makeup is good for building confidence, and that she believes it is important for people to do what they can to make themselves feel attractive and presentable. At the workshop, students received hands-on instruction on how to apply eye and face makeup and also label and organize their products and tools. Makeup artists also demonstrated application on students. Check out our photos from the event! A young woman sits still, shutting her eyes. She pulls the skin of her right eyelid up with her right hand, and applies eyeliner to that eye with her left. In a LightHouse room, two woman stand in front of a long table displaying makeup, brushes and containers. Through a window above the table, a makeup artist works with an older woman. At left, an older woman sits with her eyes closed. At right, a makeup approaches the tip of the woman’s nose with a delicate hand to apply concealer. Kate Williams sits upright, raising her right hand to her left eye to apply mascara in a bright room. A young woman sits at the edge of a table, resting one elbow atop. With her right hand, she reaches up to her face to apply makeup, while peering into a magnifying mirror sitting on the table. In a bright room, a makeup artist pulls a seated woman’s eyelid up with one hand, and applies eyeshadow with her other hand. In front of the two woman sits a table holding tissues, makeup and cream. If this workshop interests you, check out our monthly calendar which if full of exciting, rotating programs and events. On Saturday, July 21, students gathered to celebrate their graduation from the Youth Employment Series (YES) Academy, LightHouse’s employment readiness program. Students ages 16 to 24 attended the month-long immersive program, which aims to build confidence through learning first-hand knowledge, collaborating, identifying strengths and interests and gaining a sense of direction through interactive work-based experiences. Students organized, prepared and served a three-course dinner for the occasion. The graduates looked sharp in semi-formal attire that they selected and styled in conjunction with a professional attire seminar and a group outing to Macy’s. This year’s YES Academy students each had their own immersive job experience in the community, commuting to and from work while staying in the residential facilities at the LightHouse’s downtown San Francisco headquarters. We caught up with them at the YES family banquet this weekend. Their names are listed alongside the company that they worked at this summer, along with quotes from each student about their experience. Last week, LightHouse Staff spent the day with Aira, one of the leading startups to emerge in the remote sighted assistant space. Equipped with a wearable camera or mobile app, blind users can use Aira’s platform to receive on-demand sight assistance from trained professionals – privately and discreetly. The “agent,” who uses Aira’s dashboard software to keep notes on your preferences, track your surroundings through GPS and zoom in on far-away visuals. The result is a highly proficient “expert” who can efficiently identify, explain and Google anything your heart desires, opening up the blind user to a more accessible, frictionless environment. Aira’s agents are the backbone of their operation, and it’s safe to say these paid professionals have some of the coolest jobs you could imagine. Aira has put out an announcement that they are hiring agents in the San Francisco Bay Area, to work from home or from the co-working spaces available at LightHouse. If you’re interested, visit aira.io/careers. As an Aira Agent you simply log onto our dashboard from your computer at home and begin answering video calls from our customers who reside across the United States – you will help them to shop, read their mail or computer screen, cook meals or even describe individuals in social settings – the scenarios are varied and unique. You will join a small but growing team of Aira Agents who, along with training, will help you hone your skills and share your calls. Through a live video stream, you are able to see what they would be seeing, and provide the information they need to make decisions or explore their world. Hours are flexible. We offer a range of hours per day between the times of 4 a.m PST to 10pm PST. In order to apply, submit here. To see more about Aira go to Aira Inspiration or the Aira Website. People that are Enthusiastic, eager, and well spoken. People that love to search the web and find the best info. People that can multitask while remaining focused and calm. People that want to grow with a company- the opportunities are just beginning with Aira. The LightHouse for the Blind and Visually Impaired is looking for a service-oriented Information Technology (IT) Technician to join the LightHouse team, in the heart of downtown San Francisco. 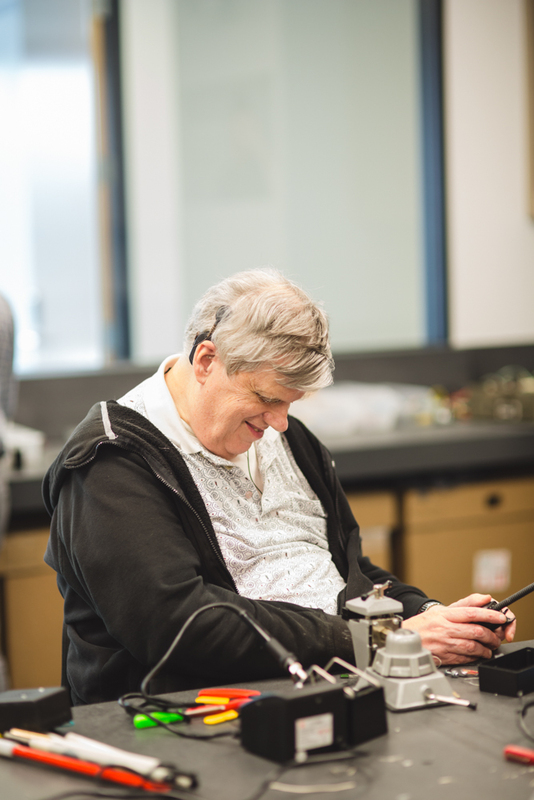 With over 90 employees and an annual budget of $12.5M, the LightHouse has the resources and imagination to help change the lives of the blind and low-vision population of the greater bay area and beyond. One of San Francisco’s oldest and best-known philanthropies, we’re operating from a new, state-of-the-art headquarters on Market Street. Here we coordinate students, volunteers, teachers, families, tech and a caring staff, to design, support and build new ways in which to help people with visual impairments. Applicants should have a history of positive and supportive human interactions, including demonstrated sensitivity to people with disabilities. Ultimately this is a service position, so the ability to interact with a variety of internal customers in a positive way is vital. Education or equivalent: A degree in Information Technology, Computer Science or Computer Engineering preferred, although relevant work experience may also be considered. A Microsoft certification such as an MCSA or MSCE would be very helpful. Experience: At least three years of experience providing desktop support, ideally in an organization of at least 30 people. Working administrative knowledge of Windows 7 and Windows 10 desktop operating systems, including settings and configuration — as well as some Apple iOS knowledge — is needed. Knowledge of workstation-class computers and laptops, including internal components and configuration. Must have understanding of network communications using TCP/IP, DHCP, DNS, and WINS. The preferred skillset includes hands-on experience with access technology, including (but not limited to) screen magnification and screen readers. Knowledge of networked printing and the ability to configure a variety of printing types either independently or under supervision. Basic experience with VoIP phone systems desired – Shoretel experience preferred, but willing to train. Ability to provide user support for audio and visual systems used within the agency for videoconferencing and media presentations desired. Also a history of setting up equipment outdoors for events, is appreciated. Other: Strong interpersonal skills dealing directly with users in potentially conflicting situations is critical, as well as the overall ability to interface with all levels of staff and guests. Produce documentation as required. A protective approach to confidential information is essential. Work experience within a nonprofit environment is helpful. Travel between HQ and our satellite offices will be required, including some overnight stays. The ability to lift and transport up to 50 pounds regularly, with occasional lifting up to approximately 75 pounds, may be required. Physical mobility and endurance to perform tasks while standing or walking for long periods of time (60 minutes or more). Ability to safely and properly use power tools and equipment. Solid physical endurance sufficient for occasional prolonged standing, bending, stooping, and stretching. Manual dexterity sufficient enough to manipulate equipment. Ability and willingness to work with exposure to sun, heat, rain or inclement weather and other environmental conditions. Serve in a first-response role to evaluate and resolve desktop hardware and software issues in a Microsoft environment. Provide phone support for an integrated VoIP system. Support, install and troubleshoot access technology including screen readers (JAWS, Window-Eyes) magnifiers (ZoomText, Magic) and other tech used by the visually impaired. Use an online helpdesk system to track activities and resolutions, in accordance with our standards, SLA and service terms. Install and troubleshoot software, printers, and basic network functions. Build and deploy workstations and laptops to requested specifications. Set up and move workstations and equipment as directed. Working directly with end-users on technical issues and tasks, either in person, by remote access, email, or phone as assigned. Other Duties: Please note this job description is not designed to cover or contain a comprehensive listing of activities, duties or responsibilities that are required of the employee for this job. Duties, responsibilities and activities may change at any time with or without notice. Please submit a cover letter and résumé as Word attachments (no .PDFs please), to hr@lighthouse-sf.org, including the job title in the subject line. We will not consider videos or hyperlinks to online profiles. Due to time constraints we will only respond to complete submissions in which there is serious interest; thanks for your understanding. As a residential camp for the blind, counselors are responsible for the overall provision of a traditional camp experience to all blind and visually impaired campers. This includes but is not limited to: inventing new blind-friendly programming, motivating campers to use non-visual techniques, adapting all activities so that all campers can participate fully regardless of their level of vision. Counselors should encourage active participation in camp meals, clean-up and other daily functions through fun activities. Counselors provide supervision to recreational activities, create educational experiences, promote independence and supervise the health and safety of children and adults. Applicants must also have the ability to work with campers that have secondary disabilities (developmental, hearing impairments and/or mobility restrictions). Participate in the development and implementation of program activities for campers within the mission and outcomes. Responsible for leading and assisting with the teaching of activities. Actively participate in all program areas as assigned. Provide for the progression of activities within the framework of individual and group interests and abilities. Assist in program areas such as waterfront, nature, all camp activities, and arts and crafts as directed. Maintain high standards of health and safety in all activities for campers and staff. Provide the daily care of each camper within your supervision including recognition of personal health needs. Ensure that campers receive their medications as directed by health care manager. Be alert to campers and staff needs and assist them with personal and/or health problems, and discuss with camp health manager and/or resident camp director when appropriate. Be alert to equipment and facilities to ensure utilization, proper care, and maintenance is adhered to; report repairs needed promptly to camp director. Be a role model to campers and staff in your attitude and behavior. Follow and uphold all safety and security rules and procedures. Please submit a cover letter and résumé as Word attachments (no .PDFs please), to hr@lighthouse-sf.org, including the job title in the subject line. Please include a link to any relevant clips or portfolio pieces. Due to time constraints we will only respond to complete submissions in which there is serious interest; thanks for your understanding. Everyone in the blindness community knows the statistics: At least 60 — possibly even as many as 70 percent — of legally blind people remain unemployed. That’s why back in 2011 we established a program to give blind job seekers the practical skills they need to get the jobs they want. Since then, our Employment Immersion program alumni have reached more than $2.8m in annual salaries and achieved an exemplary 43% placement average for alumni, which far exceeds the national average in job placement of people who are blind or visually impaired (the statewide average is 14%). Our programming is constantly evolving to meet changes in technology and the job market. On March 13, we’ll kick off our all new Employment Immersion Job Preparation Workshop at the LightHouse headquarters, which runs until April 7 and meets every Tuesday, Wednesday and Thursday from 9:00 a.m. to 3:00 p.m. The workshop’s robust and proven curriculum emphasizes confidence building to ensure job readiness — and features our tried and true lineup of classes that walk students through every step of the job application process. In the blindness community, we know that one size does not fit all, and this is reflected in the curriculum of this four-week workshop. With a combination of short lectures, interactive activities, expert speakers and candid, honest discussions, each blind or low vision student has an opportunity to explore their interests, aptitudes, and think outside the box about which part of the job market holds the highest promise for their talents and ambitions. Williams, who is a Purpose Prize Winner and nationally recognized job coach by the Wall Street Journal, is the driving force behind these achievements. She knows what it takes to get blind jobseekers into positions that suit them and keep them there — and the payoff doesn’t end on payday. With an increase in referrals as LightHouse steps in as the key provider of services in the East Bay, our Employment Immersion Program is growing and evolving to meet higher standards and increasing volume of blind jobseekers. We’re proud to bring on our new dedicated trainer Angela Denise Davis, who will add new levels of depth and expertise to our classes. This year alone we saw our alumni land jobs in major tech startups, media companies, athletic brands and more. The sky’s the limit, once the skills are there. Keep chipping away at those employment statistics and sign up for the Employment Job Preparation Workshop this spring. The workshop is open to people who are blind or have low vision, from any background, seeking any job. To sign up, contact Employment Immersion Program Manager Kate Williams at kwilliams@lighthouse-sf.org or 415-694-7324, or Employment Immersion Trainer Angela Davis at adavis@lighthouse-sf.org. YES Workshops: Making Work Fun! Photo: Group of YES students sit around a conference table watching a presentation. The December YES workshop is Making Work Fun! Each month the LightHouse offers a special YES (Youth Employment Series) workshop aimed at youth ages 14 to 26. This December we’ll focus on showing students that work can be fun and enriching — particularly when you have the practical skills to augment your big ideas. This interactive LightHouse-sponsored training emphasizes the vocational enrichment of youth who are blind or have low vision, increasing and providing individuals access to a multifaceted array of mentorship, advocacy skills and alternative accessible techniques. When: Saturday, December 3, 2016, 9:00 a.m. to 8:00 p.m.
Who: Candidates must be transition-aged students ages 14 to 26 who are blind or have low vision. They must be eligible for transitional rehabilitation services, deemed legally blind by a physician or accredited agency, and able to fulfill the training and work required by the program. Learning about the adapted form of self-defense for the blind from One Touch Project, the leading accessible form of self-defense practice. Personality Profile assessment to help gauge students’ personal employable traits. Learning various methods to access the internet, email and communicate professionally online using adaptive technology. A how-to tutorial in drawing tactile pictures in braille. A chance to engage with a working individual in the blind community. Finally, students will be offered take-home sample materials and models on how to apply their new skills in daily life. Is There a Cost to Attend YES Workshops? The cost to attend the LightHouse Youth Employment Series workshops is $175 per day-long workshop. In addition to the day’s activities and curriculum, students will receive a light breakfast, lunch and refreshments throughout the day. Department of Rehabilitation authorizations or other payment source must be secured before students will be eligible to participate. If you have any questions or wish to apply, please contact Youth Services Coordinator Richie Flores at rflores@lighthouse-sf.org or 415-694-7328. Would you like to be a YES Protégé? Sign up for YES workshops! We are currently seeking protégés for the Youth Employment Series (YES). Protégés will benefit from vocational and blindness skills training, meaningful work and volunteer opportunities, as well as career-specific mentorships with the working blind. This informative monthly series will provide transition-aged youth who are blind or have low vision with vital skills that will help them become more successful as they pursue their academic and employment dreams. 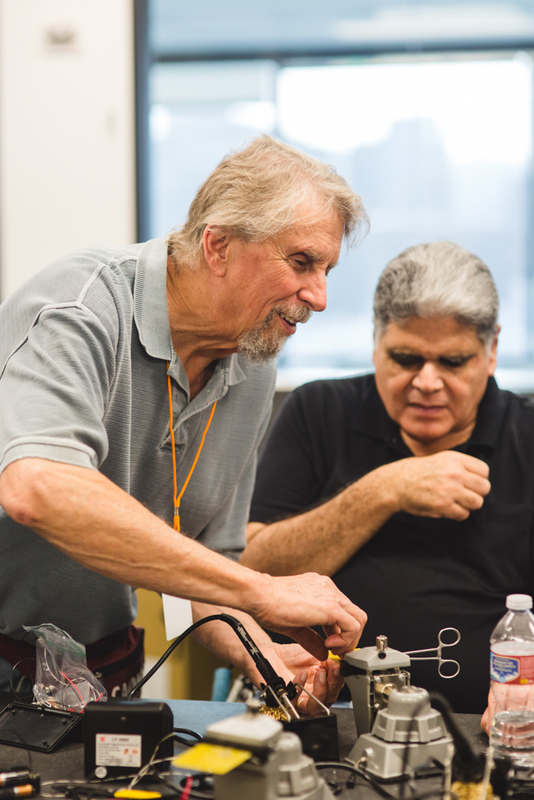 On November 6, the LightHouse held its first-ever soldering workshop for people who are blind or have low vision. It was a huge success, and we have the photographs to prove it! Scroll down for more. Soldering is a fundamental skill in electronics work that involves using a hot iron to fuse metal to form a permanent connection between electronic components. The aim of the workshop was to help students make their own accessible continuity testers – one of the most fundamental tools for students working in electronics without vision. While most continuity testers use lights to indicate the strength of electric currents, accessible continuity testers emit a range of tones — high for a free path and low for an impeded path. Unfortunately, accessible continuity testers cannot be purchased, and previous manufacturers have ceased production. Each student left the workshop with a fully-functioning accessible continuity tester for use in their future work; and the skills to solder it themselves. LightHouse extends a special thanks to Dr. Joshua Miele, Associate Director of the Smith-Kettlewell Eye Research Institute, for facilitating the workshop. The workshop was held in LightHouse’s Innovation Lab on the 11th floor. A close-up of the sign outside the STEM lab in room 1145 reads “Innovation Lab Sponsored by Toyota”. A large window reveals a few students hard at work inside the lab. A diverse array of students, instructors, and volunteers are hard at work in the LightHouse’s Innovation Lab. 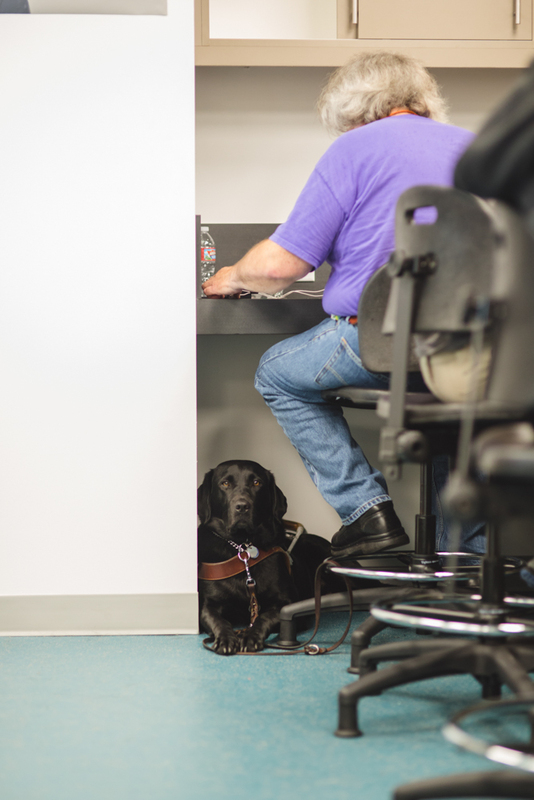 A Be My Eyes poster stands out in the background as an indicator of the space’s many uses, including as a home base for two accessibility start-ups. 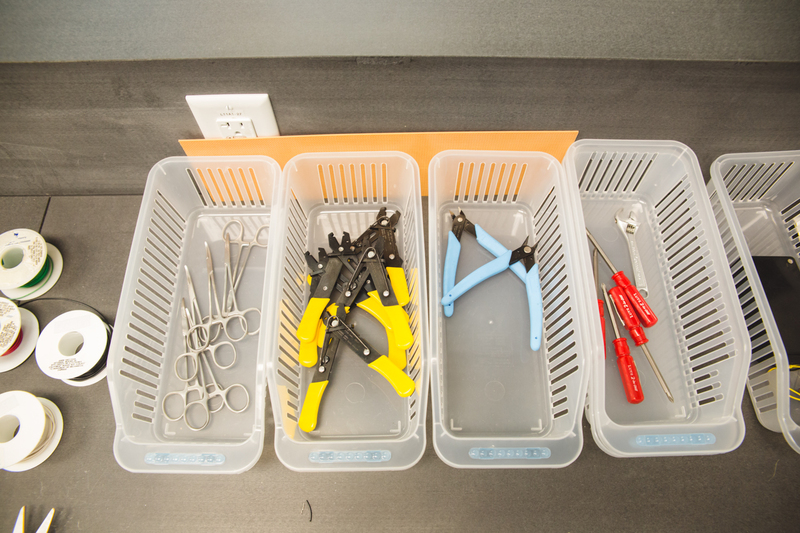 Baskets hold some of the essential components for making continuity testers: stainless steel forceps, insulated handle-wire strippers, wire cutters, wrenches, and Phillips-Head screwdrivers. A few spools of insulated wire — also essential — sit to the left. Red, green, black and white insulated wire spools sit on a table. Color indicators help sighted individuals distinguish between wires, while vision impaired students use a system of knots to differentiate between them. A close up of a student’s hand resting on the table near a soldering iron set in its station. A soldering iron is a handheld tool with an insulated handle and heated metal tip used to melt solder. A group of 13 students, instructors, and volunteers are hard at work around the long central table in LightHouse’s Innovation Lab. Six students and volunteers sit around two tables, hard at work. The grey work surface is scattered with castaway bits of wire and solder. The lab’s large windows offer a view of neighboring grey buildings. A student’s fingers slide down the length of a pair of stainless steel forceps to find the point of contact on the circuit board. This technique helps students who are blind create landmarks for soldering throughout the process. A curl of smoke rises from the tip of a hot soldering iron as a student melts points of solder onto his circuit board. A female soldering student wearing reflective sunglasses and a colorful headband leans over her work station, deep in concentration. A steel vice is used to steady a yellow circuit board for ease of work while soldering. 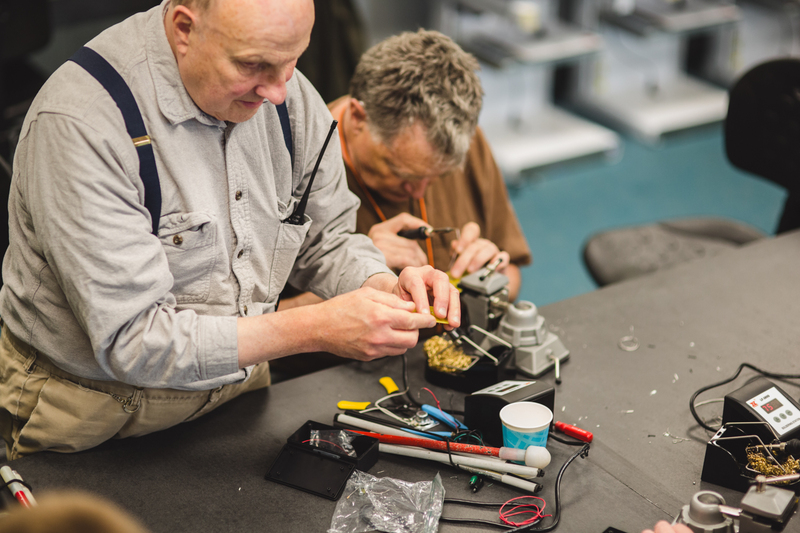 Workshop facilitator Dr. Joshua Miele of the Smith-Kettlewell Eye Research Institute oversees the work of a male soldering student. A man in a grey shirt and suspenders clasps a yellow circuit board. Behind him, a student in a tawny shirt is holding a soldering iron in hand. A smattering of tools are sprawled across the table next to a folded cane. Clasping a pair of yellow wire-strippers, a female student in a teal shirt uses the instrument’s notched jaws to remove the insulation from a section of yellow wire. Her other tools are scattered on the table in front of her. Two older male students collaborate at a busy soldering station. A middle-aged blonde male student bends over his workstation. A grey-haired student in a black polo shirt glides his hands over the notches on his circuit board. A man with long gray hair and a purple shirt sits facing away at one of the high top work surfaces in the Innovation Lab. His glossy black guide dog is on the floor at his feet, staring directly into the camera. A smiling grey-haired male student wearing a black hoodie and a white button-up sits at the table grasping a completed continuity tester. The LightHouse’s Innovation Lab will continue to offer workshops in STEM fields, so stay tuned. It is part of our mission to strengthen the representation of people who are blind or have low vision in the tech industry and other STEM fields. For more information about future workshops visit the LightHouse Calendar or contact Director of Community Services Lisamaria Martinez via email at lmartinez@lighthouse-sf.org or by phone at 415.694.7350. Photo: Kate Williams stands on the sweeping ramp inside the Ed Roberts Campus where LightHouse has its Berkeley office. Everyone in the blindness community knows the ominous statistics: At least 60 – possibly even as many as 70 percent – of legally blind people remain unemployed. That’s why back in 2011 we made a commitment to blind jobseekers to establish a program that gave them the practical skills they needed to get the jobs they wanted. Today, we’re proud to announce that the alumni of our program reached over $2.5M in salaries – $2,513,630 to be exact – and the number is growing every week. That is $2.5M in value added to our economy; $2.5M of worker time for people who didn’t know if they had what it took to compete in the job market; $2.5M that doesn’t even factor in the amount those individuals would have otherwise collected from social security and state financial aid. Kate Williams, our Employment Immersion Program Manager, Purpose Prize Winner, and job coach nationally recognized by the Wall Street Journal, is the driving force behind these achievements. In the last six months alone, Kate and her team have helped sixteen blind and low vision jobseekers find new employment. That is sixteen people who six months ago, had to rely solely on assistance from others. Here’s to more dinners together, and more success stories in 2016. The Employment Immersion Program is for people who are blind or have low vision, from any background, seeking any job. Tuesday, Wednesday and Thursday from 9:00 a.m. to 2:00 p.m.
To learn more, contact Employment Immersion Coordinator Wanda Pearson at wpearson@lighthouse-sf.org or call 415-694-7359. Employment Immersion is hiring a new job development professional. If you have the skills to help blind and low vision jobseekers thrive, apply here. Photo: (Left to right) YES students Billy Lei, Carlos Torres and Austin Walker learn about appropriate attire for job interviewing. They are standing next to a mannequin dressed in suit and tie. Each month the LightHouse offers a special YES (Youth Employment Series) workshop aimed at youth ages 14 to 26. This November we’ll focus on advocacy – including how to get accommodation, the issue of informed consent, and how to transition from high school to college or from school to career. When: Saturday, November 12, 2016, 9:00 a.m. to 4:00 p.m.
Where: the LightHouse Building, 1155 Market St., 10th Floor, San Francisco, 94103. Self-advocacy, individual rights, self-determination skills, the informed consent process as well as peer mentoring. Accommodations available to college students and those entering the workforce. Blindness skills that will enrich life and help achieve ones goals, be more confident and learn how to advocate needs. How to smoothly navigate through any system as a student transitioning into college from high school or from college to a career. Strategies that will help students make strong and positive first impressions. Developing, enhancing and utilizing ones network and relationship with peers and mentors. Sign-up now for the December YES Workshop: Taking Technology Seriously which will take place on Saturday, December 10, from 9:00 a.m. to 4:00 p.m.